This dress has the wow effect while also being comfortable. By Agnes Bridal "The One Collection" (TO-476) - 1950s inspired gowns, it is ivory with a stunning brocade pattern and bow trim at the waist and buttoned back. Purchased in Limerick, Ireland from Lilac Rose Bridal and brought to New Zealand so as to have a bit of home/Irish luck on the day. This dress makes an impression, complementing your body shape while also being comfortable to move and dance in. The pattern and style of the dress stand out and create a memorable look both within the venue and photos. The material has a beautiful texture to it also which adds to the feeling wearing this dress brings. Bustle and bra strap guides added to the dress by Rose's Alterations Auckland, to allow for peace of mind and transition for dancing/moving around guests in the evening giving the dress a whole new look (see photos). Dry Cleaning completed also at Rose's Alterations. 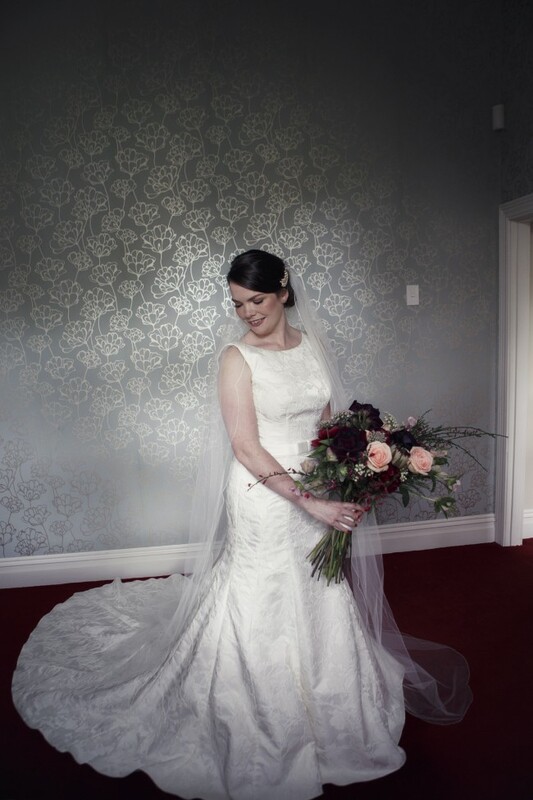 I wore the dress with a chapel length Nieve veil single tier (ivory), to add to the flowing effect of the train, which I'm open to selling also if interested. Happy for contact regarding any questions and/or offers. Bustle and bra strap guides added to the dress by Rose's Alterations Auckland. Train is held up and tidied away in a manner that complements the shape of the dress by three buttons in the underskirts - easy to do.